CBD Oil Review rates Illuminent CBD with one star because it qualifies for the Mission Badge. Illuminent has an extensive CBD oil product line and a competitive direct selling platform, offering consumers the chance to be business owners themselves by pedaling their CBD products. While the company is full of promises of innovation and quality, we find them to be lacking in just that. Illuminent offers both isolate and full spectrum options, something we love to see from CBD product manufacturers. However, their widespread use of artificial flavors and the fact that they sell nicotine e-liquids don’t sit very well with us. Illuminent CBD was founded by current CEO Ryan Botsch, a veteran of the vape industry. He created Illuminent for his “partners” to “harness their passion into a win-win for their networks”. Ipso facto, Illuminent is a direct selling platform by which people can receive a turn-key business and sell the company’s products. They claim to enrich lives through meaningful relationships, that their employees are like family, and that they help people through support, love, and encouragement. This flowery language is common with these types of CBD businesses, and we can’t help but feel on alert. When a CBD brand offers many categories, we like to see both isolate and full spectrum options. While full spectrum is arguably the better choice in that it offers other beneficial cannabinoids and phytochemicals, certain consumers aren’t comfortable with it and may be concerned of the scant 0.3% or lower percentage of THC legally allowed. 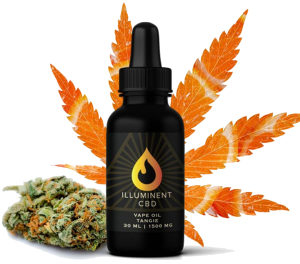 We therefore applaud Illuminent for offering full spectrum and isolate options in both their CBD tinctures and vape lines. Illuminent’s CBD product arsenal covers multiple segments. Tinctures are available in both isolate and full spectrum with eight varieties of isolate and 10 of the full spectrum. We take issue with a couple of things about these tinctures. For one, the isolate oils have artificial flavors. 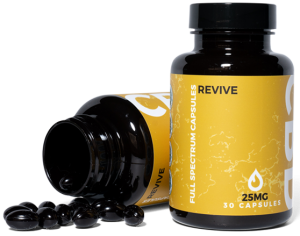 Secondly, the full spectrum tinctures are described as “100% natural and organic” but contain MCT oil that is not organic. Organic MCT oil is more expensive, but certainly not uncommon in the CBD space. Illuminent sells full spectrum CBD vape oils in seven strain-specific varieties and isolate e-liquids with more artificial flavors. 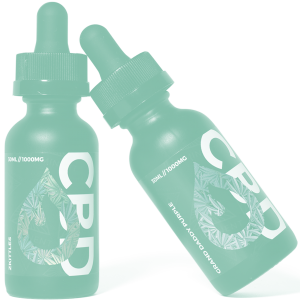 The product line is then rounded out by a CBD topical pain roller, pet tincture, gel capsules containing bovine gelatin, vape hardware, and finally, nicotine e-liquids. We can’t get past the nicotine products as we feel this sends an opposing message: buy our products to boost your health and also to compromise it. We do not know their CBD extraction method, and while Illuminent has posted CBD laboratory test results online, they are from 2017, so we cannot award them the Safety Badge. In fact, we noticed a staggering (and illegal) THC level of 0.21% from a 2017 test of their 1500 mg CBD vape tincture. 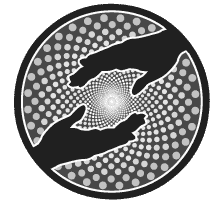 Bottom Line- Illuminent unfortunately needs to take some steps to ensure their CBD products are safer, including regularly posting test results, making sure their THC levels are legal, and jettisoning a rampant amount of artificial ingredients. We wouldn’t mind seeing the nicotine vape liquids hitting the road either. Illuminent seeks to be a leader in creation, innovation, and inspiration to help improve quality of life through their products and their direct selling platform. Illuminent CBD drops have been God sent. Better Sleep, little to zero hip pain most days, lessor auto-immune symptoms, and overall wellness has been a huge blessing to me. 50 and fabulous wasn't going so well. :) They are wonderful to work with and my family uses their products daily. Yes a couple do have artificial flavors but that personally helps me get them down. I can not stomach the "green" taste. Oh and did I mention after a 4 year struggle my liver enzyme lab work is NORMAL, huge bonus!!! I bought a Tincture lavender and peppermint. Its very oily and Ive gotten more off of Native CBD gummies than i have this oil! Idk if the person i bought it thru messed with it but the native brand gummies are 10x better! Illuminent CBD has been the only CBD product to help me. It has done some pretty great stuff for me! The people are nice and helpful and not pushy. They are constantly trying to improve the products! And it’s not pushing a bunch of innacurate bogus so called facts! It’s all around the best company and product I’ve found! I find Illuminent products to be AMAZING! I went 3 years without being able to walk due to degenerative disk disease! I have been 100% pain free for over a year!! I have been taking Illuminent CBD for 1 year consistently & it has changed my overall health & mindset.